Two years ago, a crack appeared on an ice shelf along a stretch of Antarctic coast. The fissure has grown substantially since then, raising concerns that it will break free and form an iceberg over twice the size of Manhattan. Ice shelves are thick plates of coastline ice that float over the ocean. This particular ice shelf, called the Nansen ice shelf, measures about 30 miles (50 km) long and 20 miles (35 km) across. In 2013, geologists noticed that a crack had formed on the shelf running parallel to the coast. Satellite images taken late last year show the degree to which the crack has grown since that time. Scientists are now saying the entire structure could break free from the continent and float into Terra Nova Bay in the Southern Ocean. Back in December, geologists Christine Dow and Ryan Walker observed the site from helicopter. Dow captured this stunning image of the crack during the flight. This sort of thing happens from time to time along the Antarctic coast, and it’s not necessarily related to climate change. Some of these events are cyclical, as ice grows, breaks free, and then grows back again. Back in 2008, for example, the Wilkins ice shelf disintegrated into dozens of large glaciers. Years later, the remnants of the collapsed shelf could still be seen from space. Also in 2008, the Serson ice shelf along the northern coast of Canada’s Ellesmere Island experienced a significant retreat—an event that has been linked to climate change. 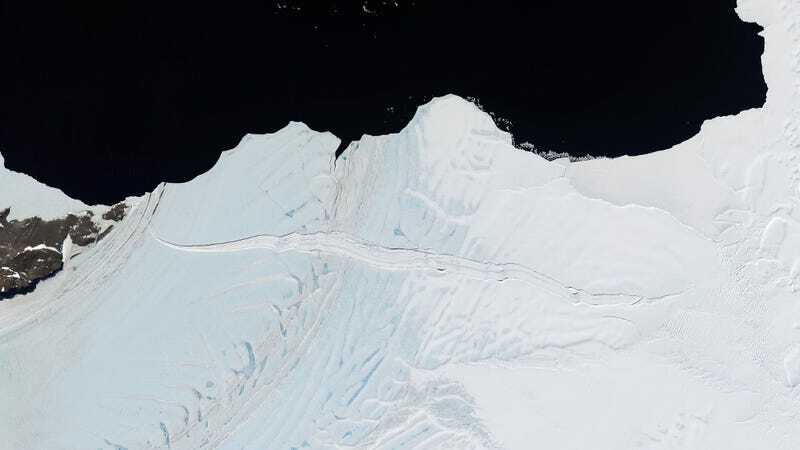 Finally, there’s B-15T, the largest iceberg ever observed by geologists. Calved from Antarctica’s Ross Ice Shelf in 2000, it measured 183 miles (295 km) long and 23 miles (37 km) wide. That’s larger than the whole island of Jamaica, and about the size of Connecticut. Over the years it broke up into smaller pieces, including B-15A, which covered 2,500 square miles of sea surface area. Most icebergs get caught up in the swirling Antarctic currents and fall apart, but this one stayed trapped in the cool coastal waters where it could remain for decades.